Bright and early Friday morning—6 a.m. MST, to be exact—what was once the Bears Ears National Monument will be open to those who want to mine it. They can arrive at the now-unprotected land to, literally, stake some claims. Thank President Donald Trump for that. His proclamation to modify (more like erase) the designation for Bears Ears was clear: 60 days after December 4, 2017, protections against mining would be lifted. The 60 days have arrived—a slap in the face to the five sovereign tribal nations that have attempted to protect these lands they consider sacred from any further development. The development could also threaten the more than 100,000 cultural and archaeological sites that dot this historical landscape. ,” Greg Zimmerman, deputy director of the Colorado-based Center for Western Priorities, told Earther on Thursday. 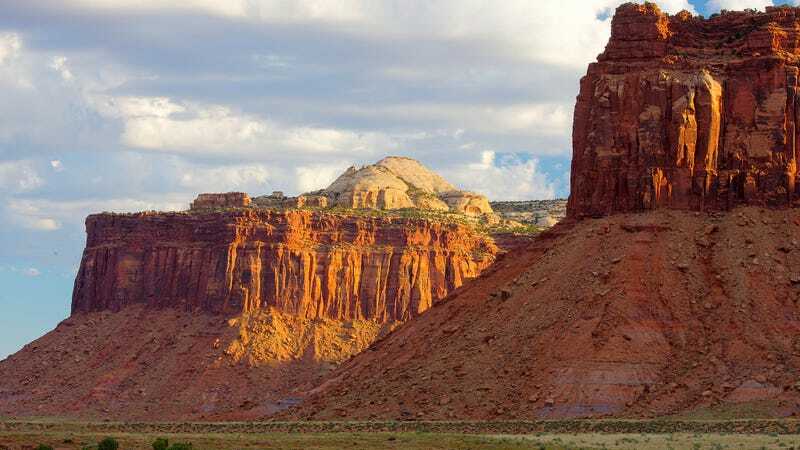 Private individuals and companies can head to Bears Ears, as well as the Grand Staircase-Escalante, with stakes in hand to claim lands they want to develop for hard rock mining, which includes minerals like gold, uranium, silver, and copper. All these people have to do if they think a parcel of land looks ripe for mining is stick a metal or wooden post (otherwise known as a stake) in the parcel’s four corners—or build a pile of rocks, as described in this blog post—and attach a written notice. Then, they just gotta’ pay some fees to the local Bureau of Land Management office, which could be as low as $155 for every 20 acres. This is all based on the 1872 General Mining Law. The whole process feels straight out of a western cowboy movie. When I asked Zimmerman what would happen if someone just moved another person’s stakes and claimed it as their own, he joked that they’d probably determine ownership over a gun duel. “The primary law that guides hard rock mining on public lands is a really frontier-era law and is in desperate need of updating,” he said on a more serious note. Bears Ears is known to have substantial uranium mineral deposits. Grand Staircase-Escalante, on the other hand, has some vast coal fields. All this stuff is up for grabs—for the time being. What remains of the Bears Ears National Monument, which once stood at 1.35 million acres, is a mere 201,000 acres. For the Grand Staircase, Trump reduced its 1.7 million acres to 1 million. Multiple lawsuits are ongoing in response to Trump’s reversal of these national monuments. Opponents claim this was illegal as hell. But what will happen to these land claims if a judge rules similarly? Zimerman can’t say for sure, but the land claims (of which there are dozens in Bears Ears, apparently) that existed pre-designation didn’t just go away after former President Barack Obama placed protections on these regions in December 2016. A judge might have to decide if these new land claims will carry merit in the case of a re-designation. Well, that’s if any new land claims arise. A representative with Energy Fuels, a company with land claims already in the region, told the Washington Examiner the company has no plans for new land claims. But others might. What&apos;s Left When a National Monument Is Reduced by 90 Percent?